he technology to 3D print a single part from multiple materials has been around for years, but only for polymer-based additive manufacturing processes. For metals, jobs are typically confined to a single powdered base metal or alloy per object. However, researchers at NASA’s Jet Propulsion Laboratory say they are in development of a 3D printing technique that allows for print jobs to transition from one metal to another in a single object. According the JPL researchers, these gradient metals have been created previously in a lab setting but NASA’s process is the first to make usable objects that take advantage of the mechanical and thermal properties of the various metals used. According to the researchers, the process is based on Laser Deposition technology, in which metal powder is injected into a high-powered laser beam that melts the surface of the target object to form a small molten pool. Powder applied to this pool is absorbed and leaves a deposit as thin as 0.005 in. thick. These densely bonded layers can then be used to either build or repair metal parts. In JPL’s technique, the build material’s composition is gradually transitioned as the print progresses. For example, the powdered build material might contain 97 percent titanium alloy and 3 percent stainless steel at the beginning of the transition. Then, in 1 percent increments between layers, the gradient progresses to 97 percent stainless steel and 3 percent Ti alloy by some defined point in the overall 3D printing process. The main benefit — in addition to testing the metallurgical properties of new alloy compositions – is to take advantage of the differing physical properties (i.e. thermal expansion, magnetism or melting temperature) of the two or more metals in one solid component, say the researchers. 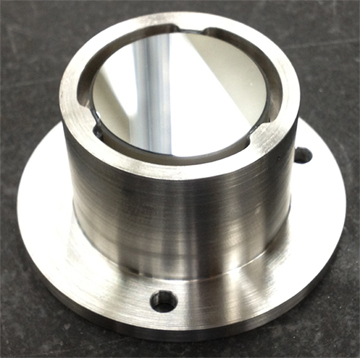 For example, JPL created a gradient alloy mirror mount for a space optics application, composed of stainless steel at its base and Invar (an FeNi alloy) at the top. Typically, epoxy is used to bond glass mirrors to the mount, which is fastened to an optical bench. However, in the extreme cold of space, the difference in thermal expansion between the glass mirror and metal mount can cause epoxy to crack and fasteners to shrink, shifting the position of the mirror. Using the gradient alloy mount, the glass mirror can be bonded to Invar, which has a thermal expansion coefficient that matches glass. At the same time, the stainless steel in the mount’s base can be welded to the optical bench, similarly eliminating a thermal expansion mismatch. While the process may seem trivial on the surface, the researchers say its more complicated than simply adding and subtracting the various build materials from the mix; in most cases, brittle intermetalic compounds form and leave parts susceptible cracks. To address this, the researchers have developed a technique that uses multi-component phase diagrams as maps for composition selection so as to avoid unwanted phases. In addition to the linear process, the researchers have developed a radial deposition method that builds gradient metal parts from the inside-out rather than bottom-up as in traditional AM processes. In this technique, a base metal rod is rotated by a motor in the LD system build space. 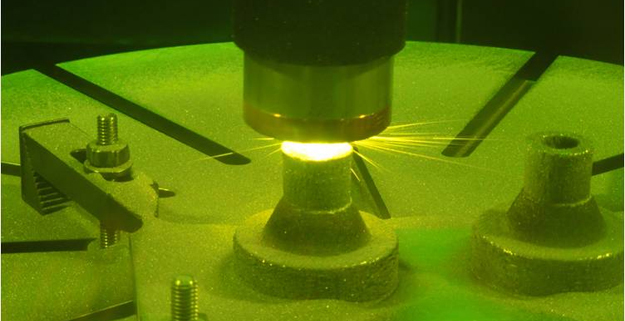 During the print, the laser deposits layers of gradually changing metal build material as the rod spins. Once a single layer is deposited, the composition is changed for the next layer and so on. 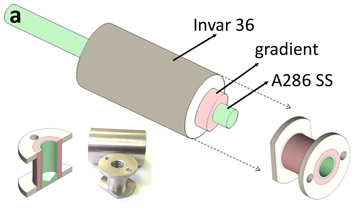 While similar, radial deposition allows for 3D printing gradient metal parts (such as cylindrical fastener inserts) not possible using traditional linear AM processes. Currently, JPL says it is developing its gradient metal technique for future space missions but acknowledge that it could also be used in automotive and commercial aerospace applications. A report on the JPL researchers’ work was published in Scientific Reports. Coauthors include Douglas Hofmann; Scott Roberts, Joanna Kolodziejska and Andrew A. Shapiro from Caltech and JPL; R. Peter Dillon, Jong-ook Suh, and John-Paul Borgonia from JPL; and Richard Otis and Zi-Kui Liu from Pennsylvania State University. The work was funded by NASA.